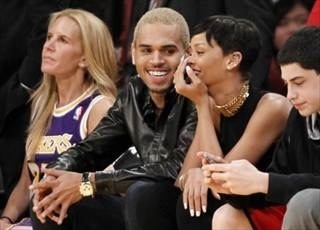 Rihanna and chris brown are spotted cozy up court side at the lakers vs knicks game today. There’s been rumors going around that R&B recording artists Rihanna and Chris brown are back together. Well if today didn’t confirm I don’t know what else would do it! I mean if they aren’t together and he’s still dating his suppose girlfriend karreuche he would be with her for Christmas not cozy up court side with his EX girlfriend (who refers to him as her “BFF”) but with his girlfriend. I dig the two because they aren’t worried about the media when it comes to their relationship….but….WE WOULD LOVE A CONFIRMATION! Lol pictures below of the two at the game. Rihanna wiping something off of Chris face. Chris telling Rihanna something in her ear.